Use those coupons for free clothes! Coupons are not just for groceries and household items. You can also use coupons on clothing. A lot of stores will mail or email generous coupons in order to get you in the door. This past weekend I was at the mall and was able to take advantage of some great promotions. My first stop was Victoria’s Secret where I got a pair of underwear completely for free. I resisted the urge to purchase anything else, and shamelessly checked out with my free underwear. That pair regularly sells for over $11! 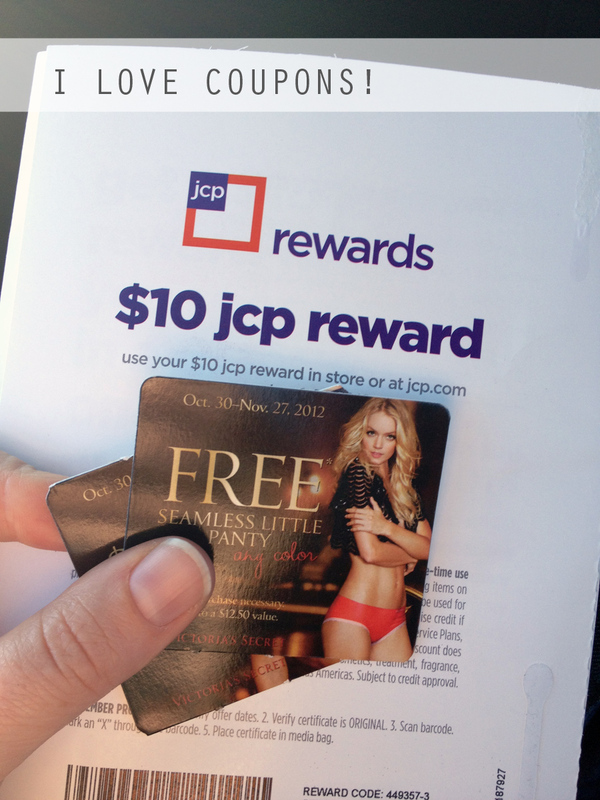 I also had a $10 off coupon at JC Penney and used that replacing a pair of ripped tights. They’re the fancy tummy-sucking in types, so I spent $8 on an $18 pair of tights. My only other purchase that day was two $6 shirts at Old Navy for my niece. I managed a day of shopping for less than $25, considering tax. I would say that was a good day! PS Bed Bath & Beyond will often let you use expired coupons. Especially when it gets crazy around back to school or the holidays. I know this from working there. Awesome! Thanks for the tip, Shalini.